Yellow teeth can be caused by several things. Conditions that can disturb this appearance will be seen more clearly with age. Smoking habits, eating certain foods or beverages, also the cleanliness of teeth and mouth that is not awake, can be a cause of yellow teeth. 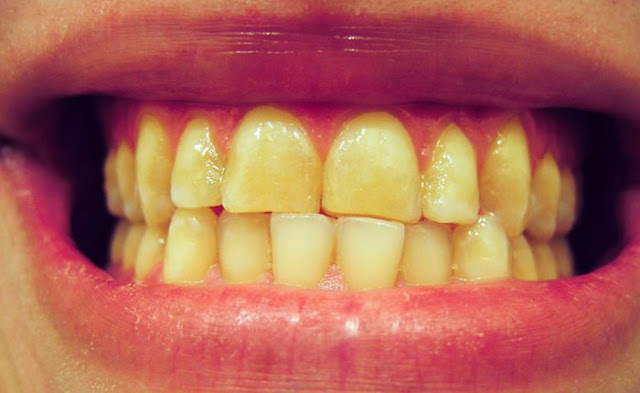 As we get older, the white tooth enamel layer is getting thinner, so the yellow dentine layer becomes more visible. In addition, the food and beverages we consume daily can accelerate the discoloration of teeth into yellow. The content of chromogen or dye in foods and beverages is one of the main causes of yellow teeth. This dye can cause stains on tooth enamel. In addition to the chromogen content, the acidity of the food also affects the color of the teeth, because high acid levels can erode the enamel layer. Some of the things below can cause discoloration of the teeth, including the cause of yellow teeth. This drink contains chromogen and tannins that have a bad effect, especially as the originator of tooth stains and the cause of yellow teeth. Coffee and black tea can also be a cause of yellow teeth because of its high chromogen content, coffee also has acid properties that can damage teeth. If you like to consume tea and be afraid of its effects on teeth, you can choose a clearer color green tea. Drinks Sugar-colored dark drinks are acidic and rich in chromogen make carbonated beverages very easy yellowing. Fruits with very bright colors can leave stains on the teeth. Not only the fruit, processed foods from the fruits, such as juice or cake, are potentially the same. Fruits of this category include blueberries, tomatoes, blackberries, cranberries, cherries, and grapes. Various types of candy with artificial coloring is one of the causes of tooth stains, especially if consumed regularly. Candy marks can leave a stain is to see the color left on the tongue after we eat it. Not brushing and did flossing regularly, will make increasingly familiar with stain teeth. Both of the above habits must be done, so that the rest of the food or drink that stain is not left behind and stick to the teeth long, thus becoming the cause of yellow teeth. Smoking can cause stains on teeth. Not just by sucking, chewing tobacco also has the same effect on teeth. Some ways of prevention of yellow teeth below you can do to prevent the formation of stains on the teeth. Clean your teeth regularly, by brushing and flossing, after eating. In addition, make sure to visit the dentist every six months. Using straws while eating juice, carbonated beverages, and tea can reduce tooth stains. With this drink can be swallowed and minimal contact with the teeth. Gargle is safer after meals than directly brushing your teeth. In addition to gargling, chewing sugarless gum can also be done so that the stain does not last long in the teeth. It may be difficult to eliminate the habit of eating foods and beverages on top, simultaneously. You can try by reducing the consumption. For example, during this time you are accustomed to consuming beverage carbonated, then reduce it to once a week, not too difficult, right? Similarly, smoking. Remember, reducing your smoking habit will not only be good for your oral and dental health, but also for your heart and lungs. If tooth discoloration has occurred, some of the following actions can be done. Avoid foods and drinks that can cause stains on teeth. Perform whitening teeth, either independently or with the help of a doctor. Perform staining or coating of teeth, at the dentist. Keep your dental and mouth health by routinely cleaning it. In addition, to maintain healthy teeth and mouth, you also need to routinely check the teeth to the dentist every 6 months.